Special Offer.Buy 6 Bottles for £47.50 each. Save £15.00 !! Single Bottle Price - £50.00. In May 2012, Champagne Bollinger launched a new bottle shape, inspired by a nineteenth-century bottle rediscovered in the company's cellars which dates back to 1846. This brand new bottle design, unique in Champagne, while rooted in the company's history, aims to express better still all the qualities of a great Champagne. "The idea in using the curved shape of this old bottle was to aim for the perfect balance of a 'small magnum' with curves more pleasing to the eye than those on the standard bottle. In addition to aesthetic reasons, using the shape of this new bottle, which is more like a magnum with a narrower neck and a wider base, should very slightly slow down the oxygen exchange and therefore give a better quality wine." The ratio (neck diameter/base diameter) of the 1846 bottle is closer to the standard magnum than that of the standard bottle. A new cuvee at Bollinger is always an event and a long story. Bollinger Rose fully belongs to the Bollinger family. Its main component is the Special Cuvee blend that has always embodied Bollinger's style and high standards. Bollinger Rose is made by adding red wine. Bollinger has always had a singular relationship with red wine and a personal bond with neighbouring Burgundy. 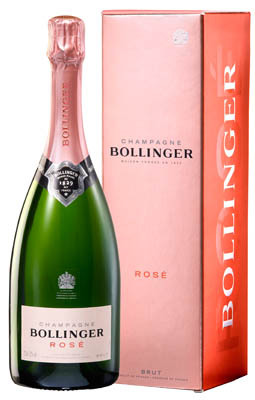 Red wine accounts for 5 to 6% of the Special Cuvee blend giving birth to Bollinger Rose. The colour of Bollinger Rose combines the rich bronze highlights of the Special Cuvee and the intense depth of the red wine. This could be the tint of the raw flesh of wild salmon barely reddened over charcoal. It is a light and a depth. It is the colour of a great wine. gains in fullness and climaxes with mellow notes that stay on the palate and resound in the memory for a long time. Bollinger Rose NV is assembled from Grands and Premiers Crus from La Montagne de Reims and La Cote des Blancs. "Bready autolytic characters combine with a soft and smooth finish to make an elegant, complex wine. Wonderfully pure and classy." "Since its launch in 2008 this wine has been consistently impressive. From its mid-salmon colour to its restrained summer pudding aromas and delicate texture, it is one of the most perfectly harmonious and drinkable rosés on the market. Drink now-2013."